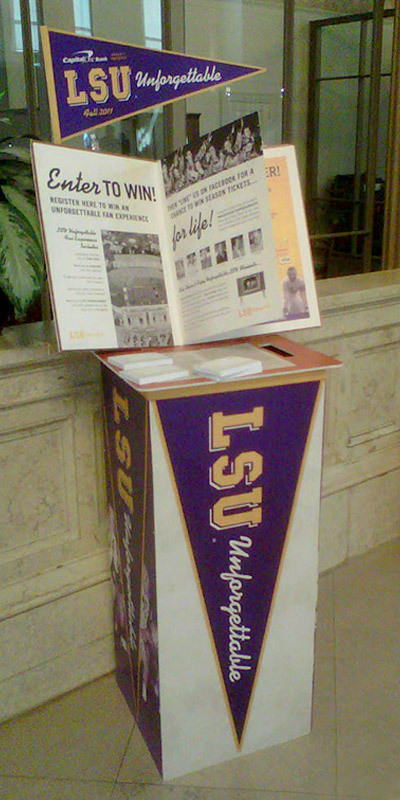 Assignment: My team was engaged to bring to life the sweepstakes for the bank's 2011-2012 LSU Football Athletics sponsorship. This involved a two-point entry, each leading to a specific prize. This campaign was fully integrated, including in-branch display, on-site game day experiential marketing, and Facebook activation. 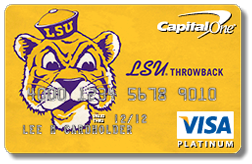 Debit card and credit card products co-branded with LSU Athletics supported the swepstakes. 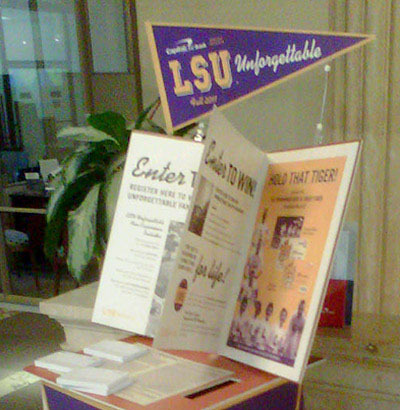 On the 2009-10 LSU Athletics sweepstakes, my team delivered an iconic entry point for the in-branch experience. Going into the 2011-12 sweepstakes, I challenged the art director on the project to deliver a new and more engaging experience. 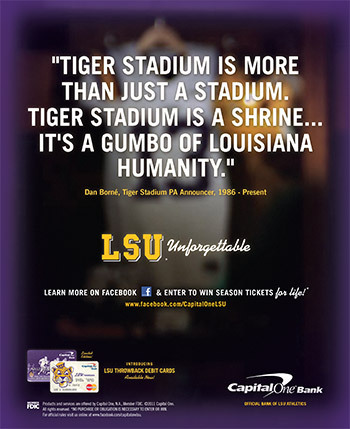 The parameters I set were: 1) Iconic and utilizing the LSU Athletics brand; 2) interactive - it should call out to customers, yet be able to withstand a season's worth of abuse; and 3) Informative - the entry point needed to plainly spell out what the customer was entering to win as there was a different prize for "liking us" on Facebook. My art director delivered right out of the gate, delivering right on my expectations. There were various other component in-branch that utilized this theme, including drive-up lane banners, window clings, digital display screens, outdoor signs and teller line signs. 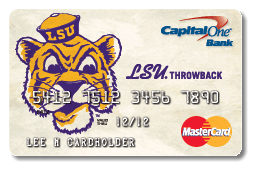 This visual theme was also carried over to signage used on game day at Tiger Stadium. 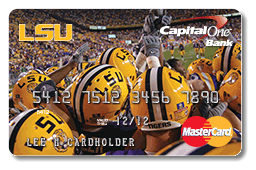 The print ad on the left featured new LSU debit cards. 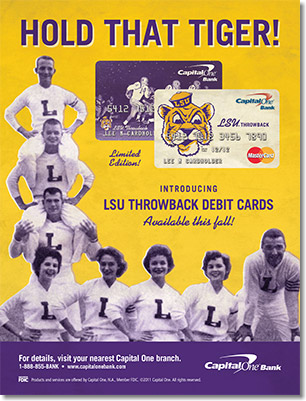 This promotion was unique in that the bank was offering the throwback debit cards for a limited time only. After the season concluded, these cards would no longer be available. The print ad on the right served the purpose of driving fans to Facebook to like our page. By liking our page, fans would be entered to win "free tickets for life" - a different prize than the one offered in-branch. My specific role in working on the print ads was setting strategy for the two ads and driving the art director with photo selection and theming of the layouts. 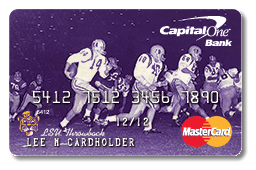 To kick off the sweepstakes, I proposed to the Sponsorships Strategy Director that we redesign the existing debit and credit card suite to feature new artwork. The cards shown here are the result of my idea. I worked with the art director on the project to select appropriate imagery as well as personally handling the layout on the non-throwback card designs. 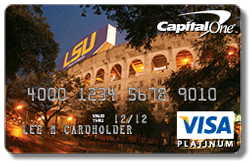 The Capital One Bank LSU page was the secondary entry point for the sweepstakes. When a user liked us on Facebook, they would be entered to win season tickets for life. Shown here are the pre-like page and the liked page. Once a user liked the page, they would be privy to custom content, served up weekly throughout the season. The video content was "Unforgettable Moments in LSU History" as told by various staff, coaches, band directors, etc. My role on the Facebook portion of this project was working with the art director and the brand-marketing manager to help create content and define the look & identity of the page. I often found myself writing copy and assisting in the weekly graphical updated to the page.